18V, 1/2", M-Force Driver Drill Kit, 2 Piece D-31 Motor With Dual Ball Bearings For Longer Motor Life, All Metal Gear Transmission Creates Efficient Power, Shift Lock Drive System Instantly Shifts From Drill To Driver Mode, 2.6AH Nickel Metal Hydride Batteries Outlast Any NI-CD Batteries, Locking Ratcheting Chuck Securely Grips All Bits, Includes 2 Batteries, Multi-Voltage Charger, Keyless Chuck, Tool Case. I bought this drill to replace a Makita 9.6 volt. I had used the old one until the batteries died. I bought the 9.6 volt in a pawn shop and used it for years. This 18 volt is really great for my needs. I am a female with smaller hands. So, most of the higher voltage drills are to heavy for me to use for very long (short time with two hands). I appreciate the adjustable clutch. I have a Dewalt corded drill. There are times when I need to drill then drive without having to change accessory's so two drills are really handy. The Dewalt handle is so big and heavy. My fingers won't reach around it. The Dewalt does not have an adjustable clutch. You are suppossed to be able to adjust it with pressure of the fingers (ha). The short charging time on the Makita is great. I do not have to leave it plugged in for hours. I am really enjoying using my new Makita. Getting the 18v Ni-MH for the same price the 12v NiCd runs at Lowe's should be a no-brainer for most sane people, and the extra battery just sweetens the deal. 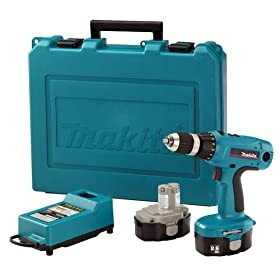 Makitas are built like tanks, sit well in the hand and the only other brand of drill I'd ever even consider dropping this much money on is Milwaukee--the rest just feel like cheap (yet expensive!) toys. The only thing I can find to complain about is the fact that they don't throw in the magnetic chuck. I mean really, who's NOT going to want that thing? Stick it in the dang case already. I replaced an older Porter Cable 12v NiCd drill with this Makita. Night and day difference. The torque on this unit is outrageous, it's light and it's made in the USA. Not a Home Depot trinket; this is a real tool. Makita is my choice in power tools. Makita rocks! For durability, reliability and portability, Makita can't be beat. This unit has been absolutely flawless. Power is incredible. It drove a 1/2"x3" lag screw deeper into wood farther than an AC DeWalt unit. Both were in low DeWalt reached halfway, the makita shortly past 3/4 of the length. NiMH batteries last decently and recharge fast. New Lithium Ion battery units (Makita LXT) have since dethroned this unit in overall charcge cycle duration, and also weigh less. I have owned this unit for 3+ years without the slightest problem. Hey what can I cay, it's a MAKITA !!!! !, The best you can own !!! I bought a few of these drill for my overseas brother from Amazon and popular auction site on internet. The batteries of these drill from auction die after one year of usage, but the one from Amazon still good. If you want to buy a brand new drill of this. I recommend you get it from Amazon. Hope this help. This is my second 18volt Makita. First lasted 6 years of mid to heavy use and two sets of batteries before the trigger switch failed. Ordered this one to replace it and then found a new trigger switch for the old one and have it working again....great to have two on hand! Just got this drill couple days ago, so at this point I can't speak to battery longevity. However, what I can say, if you know tools like I do, just picking up this drill and then listening to the sound of it, one can just tell it's a superior made tool, nothing chintzy about it. I would recommend this tool to anyone. I am impressed. Let me use it awhile and I'll comment on battery life. 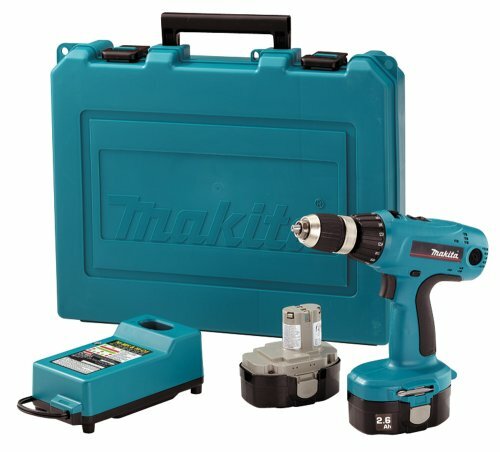 I was going to buy the 18v Lithium Ion drill by Makita, but I read too many battery complaints, so I stayed away from it and got this one. I always buy Makita for quality. This drill is no exception. For a little over the cost of a couple of batteries, you get the whole kit. Great value, great drill. This drill is actually a little heavier than I like but the price was right. I prefer the weight of the 14.4 volt units but this drill/driver works great. I have bought quite a few items from Amazon and have had very good experiences every time. This is my third drill I have purchased in the last 6 or 7 years. I have evolved from a small Craftsman 19.6 volt cordless, to a corded Makits, to this. I found this drill on sale (about 2 years ago), along with a free Makita tool belt, and snatched it up. I couldn't be happier with it. I have built two fences with it along with the general odds and ends around the house. This drill has never let me down. The charge lasts a long time and it has good power. I am sold on this drill and will look for a new one, like this, if this one ever breaks. power is really good. I feel like it was a good value for me. I love this drill, it is a little heavy but strong as bull! You can't go wrong with a quality piece at a good price....no more junky ni-cad batteries too! It works great. I have used it for over four years and it does has never let me down. The extra battery is a must. I've had this drill nearly two years and it has proved to be very powerful and reliable, plus the battery seems to last forever. I've drilled through 1/4" thick metal, through 25-year-old treated oak fence boards and driven 3" long screws into ancient barn supports (think petrified wood) as well as more normal things. I bought this drill after my electric one died (couldn't handle the really hard stuff and burned out). I had doubts about a cordless drill, but not anymore. I don't use it every day. I'm not a contractor, just an ordinary female person running a little farm, but it doesn't seem to mind neglect in between uses. At first, I wondered if the weight would be a problem, but it hasn't been because the drill is so well balanced. When the battery finally wore down after many, many months of no use interspersed with very hard use, the other battery took over instantly, still holding a full charge after sitting unused for just as long (not in the charger--it's not supposed to be left in the charger) and the original one recharged in under an hour. I like having a case as I can store all the bits and such along with the drill. The drill has multiple power settings, the ability to switch seamlessly between driving and extracting which comes in handy when extracting the bit from a metal hole, and can switch between screw/drill settings. And thank heaven it doesn't need a chuck key. It's very easy and satisfying to use. Oh, and I use it to plant bulbs, stir paint and drill 1" holes in railroad ties used to build raised gardens. It has definitely made my life easier. I would recommend it to anyone. This is a powerful and useful drill. I have only used this for medium work thus far, but it worked for 6 hours driving several hundred screws on a deck project and the battery showed no signs of tiring. It has a switch that quickly changes between drill and screw mode that saves time. The charger charges in slightly less than an hour. My only disappointment is that I have not figured how to get the charger into the kit carrying box. This drill/driver is fantastic! It has torque and power to spare, long battery life, easy and quick recharging, and great balance/feel for an 18V. Haven't had it long enough to comment on battery life. It drives 3 1/2" deck screws into treated lumber with ease. Also, has a light touch to the trigger for working with smaller bolts. The perfect balance makes it seem much lighter than it is, and user fatigue isn't an issue. The case is quite large, but provides plenty of capacity for bits and drivers. A great value. Amazon price and free shipping are the deal. Plus, many experiences and a couple of returns with Amazon - all easy transactions.